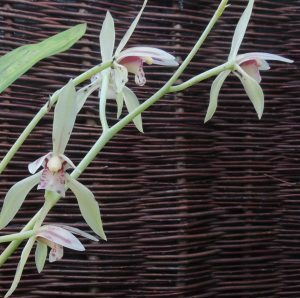 This is a small growing Cymbidium found across a wide range from the Himalayas t0 Japan and south through South East Asia and Malaysia. It is a terrestrial species in cool evergreen forests from 2000-2300m where it grows in leaf litter and moss. To reflect its natural habitat we grow the species cool and shaded and keep it damp all year in pots of baskets. The pseudobulbs have a slight climbing habit which makes regular repotting a good idea and as it produces just a couple of thick roots each year these need protecting from slugs and snails as they emerge from the base of the new growth.